Our English-speaking tour guide and driver will pick you up at Tianjin Cruise Port and drive safely to Beijing (about 3 hours). Visit Tiananmen Square, the largest city center square in the world and Forbidden City which is the home of 24 emperors from Ming to Qing Dynasty. Return to the hotel after the tour. Set out early in the morning, drive to one of the most famous attractions of Beijing—Mutianyu Great Wall which has splendid scenery but less crowded than other parts. After lunch, go to see Ming Tombs where lie the mausoleums of thirteen emperors of the Ming dynasty. Be transferred back to the hotel after the tour. Pick you up from the hotel, and then drive to visit Temple of Heaven, which was the venue for the Ming and Qing emperors to offer sacrifices to the Heaven and pray for harvest. Afterwards, head for Hutong with rickshaw, which is one of the unique special features and symbols in Beijing. After lunch, let’s tour in Summer Palace, the best preserved imperial garden in the world. Fly to Xian from Beijing in the morning. Upon your arrival, our tour guide & driver will pick you up from the airport, then, visit Terracotta Warriors and Horses which are the most significant archeological excavations of the 20th century. After lunch, we are planning to visit two attractions of Xian– Xian City Wall, which is one of the most famous attractions in Xian and Big Wild Goose Pagoda that is built to store and translate Sanskrit Buddhist Scriptures that a monk brought from India. Return to the hotel after the tour. Take the High-speed train to Luoyang. 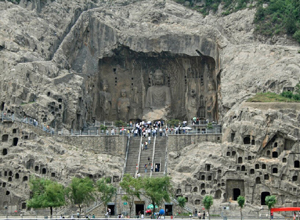 Go to see Longmen Grottoes, 13 kilometers south of Luoyang City, is regarded as one of the three most famous treasure houses of stone inscriptions in China and the Shaolin Temple which is probably the most famous temple in China and is known as “ the Home of KongFu”. After the tour, we will take the high-speed train back to Beijing and drive to the hotel. Our driver will transfer you to the airport for your departure. End of our service!